It is certain that global mean land surface temperature has increased since the late 19th century. This is primarily due to the increase in greenhouse gases from human activities. Temperatures measured on land and at sea for more than a century show that Earth's globally averaged surface temperature is rising. Global warming — the average increase in land as well as sea surface temperature — is primarily due to the increase in greenhouse gases from human activities. Rising land surface temperatures affect glaciers, ice sheets, permafrost, and the vegetation in Earth’s ecosystems. Increases in land surface temperature also have serious health implications for humans. What is land surface temperature? Land surface temperature is like the skin temperature of the Earth—it’s how hot or cold the ground feels to the touch—and it is a key variable that scientists use to study the exchange of energy and water between the land surface and the atmosphere. Though related, land surface temperature is not the same as air temperature since the land surface heats and cools more quickly than air. Physical properties like vegetation density, soil moisture, and snow cover can affect land surface temperature. Scientists measure land surface temperature through direct measurement and using data from satellites. Only seven percent of the heat trapped by greenhouse gases stays near the land surface; the other 93 percent is stored in the ocean. For this reason, the combination of land and ocean surface temperature data is a better indicator of global warming than land surface temperature alone. There has been a rapid increase in the average temperature of the contiguous United States over the past several decades. Recent (up to 2006) 30-year temperatures across temperate North America (including most of the continental United States) are the warmest over the past 1,500 years. 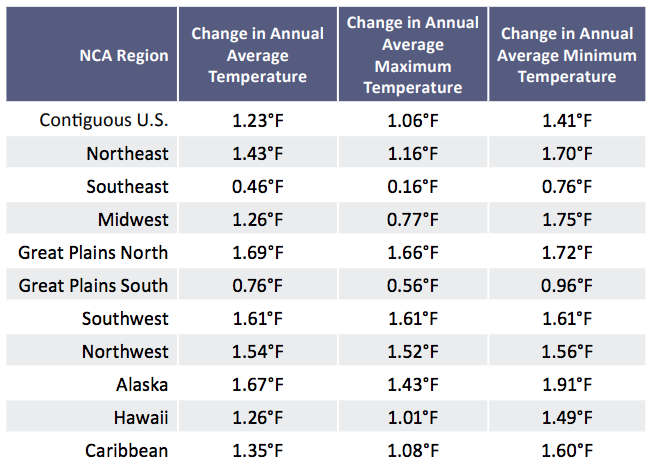 More than 95 percent of the land surface of the contiguous United States had an increase in annual average temperature from the start of the 20th century through 2016. Temperature increases in the US are largest in Alaska, which experienced a 1.9°F minimum temperature increase between 1925-1960 and 1986-2016. (NCA 4, 2017): Several detectable anthropogenic influences on average temperature have been reported for North America and parts of the United States. (NCA 4, 2017): The Southeast stands out as the only region with no “detectable” warming since 1901. For each of the seven continental regions, average temperature for 1971–2000 was higher than for any other time in nearly 1,400 years. Global land temperature in 2016 was the warmest on record—relative to the 20th century average—with a temperature departure of 2.6°F (1.42°C). This beat 2015's record of 2.4°F (1.32°C). The years 2014 and 2013 were the 6th and 7th warmest on record. These data points are consistent with the dramatic increase in land surface temperatures since 1950 due to global warming. (NCA 4, 2017): The likely range of the human contribution to the global mean temperature increase over the period 1951–2010 is 1.1° to 1.4°F. This translates to a likely human contribution of 92 to 123 percent of the observed 1951–2010 change. (Fischer and Knutti 2015): About 75 percent of the moderate daily hot extremes over land are attributable to human-caused global warming. (Chan and Wu 2015): About 5.7 percent of the global total land area has shifted toward warmer and drier climate types from 1950–2010. These changes of climate types since 1950 cannot be explained as natural variations but are driven by anthropogenic factors.